Discussion in 'YRC Freight' started by Fake News, Nov 10, 2018. First I’ve heard of it. albag, aztec warrior and bigtruk_us like this. I filled out a contract proposal survey paper that we could just put it in the Stewards/bid box supposedly would go to the local. albag and aztec warrior like this. 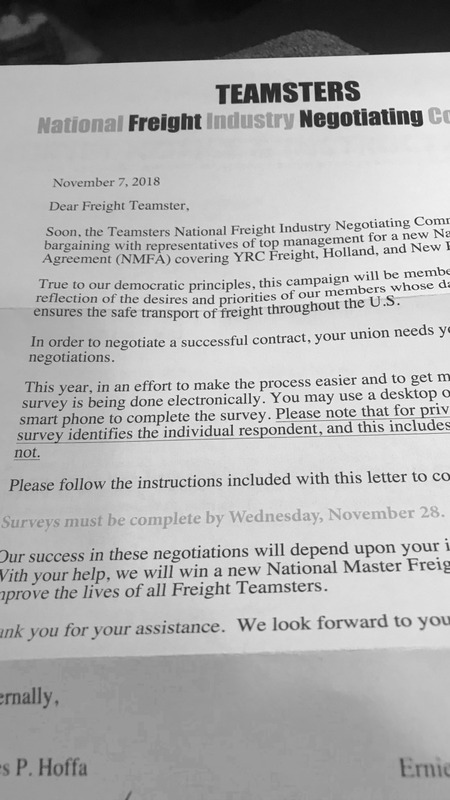 I got a letter on the mail from the IBT today. No mail in, you had to go online to complete the survey. allnightrain44 and albag like this. Best I could do for you there Elwood. Haven’t received anything by mail nor any ‘access code’ that would allow me to log in or respond. Could this be localized or regional? It’s curious that my BA did not bring this to my attention, but he may be ‘deeply’ involved in the UPSF negotiations/vote. Best I could do there. I’m waiting for Trip to bring it on the Central Overland. Big Dave, albag and aztec warrior like this. kick out the union, bring back market wages. union is failing while wasting dues money. I got one but I filled out a paper survey and turned it to the local.Internet survey probably be treated just like the job survey most of us took earlier this year.Bottom line was a management issue. aztec warrior and Elwood like this. Thanks, but no access code until it comes via snail mail. Maybe tomorrow?